One of the most significant differences between the New World's major areas of high culture is that Mesoamerica had no beasts of burden and wool, while the Andes had both. Four members of the camelid family--wild guanacos and vicunas, and domestic llamas and alpacas--were native to the Andes. South American peoples relied on these animals for meat and wool, and as beasts of burden to transport goods all over the Andes. 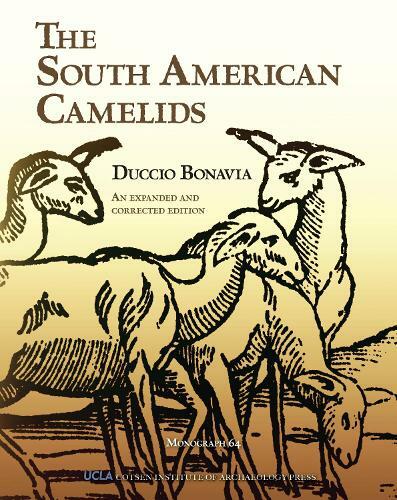 In this book, Duccio Bonavia tackles major questions about these camelids, from their domestication to their distribution at the time of the Spanish conquest. One of Bonavia's hypotheses is that the arrival of the Europeans and their introduced Old World animals forced the Andean camelids away from the Pacific coast, creating the (mistaken) impression that camelids were exclusively high-altitude animals. Bonavia also addresses the diseases of camelids and their population density, suggesting that the original camelid populations suffered from a different type of mange than that introduced by the Europeans. This new mange, he believes, was one of the causes behind the great morbidity of camelids in Colonial times. In terms of domestication, while Bonavia believes that the major centers must have been the puna zone intermediate zones, he adds that the process should not be seen as restricted to a single environmental zone. Bonavia's landmark study of the South American camelids is now available for the first time in English. This new edition features an updated analysis and comprehensive bibliography. In the Spanish edition of this book, Bonavia lamented the fact that the zooarchaeological data from R. S. MacNeish's Ayacucho Project had yet to be published. In response, the Ayacucho's Project's faunal analysts, Elizabeth S. Wing and Kent V. Flannery, have added appendices on the Ayacucho results to this English edition. This book will be of broad interest to archaeologists, zoologists, social anthropologists, ethnohistorians, and a wide range of students.